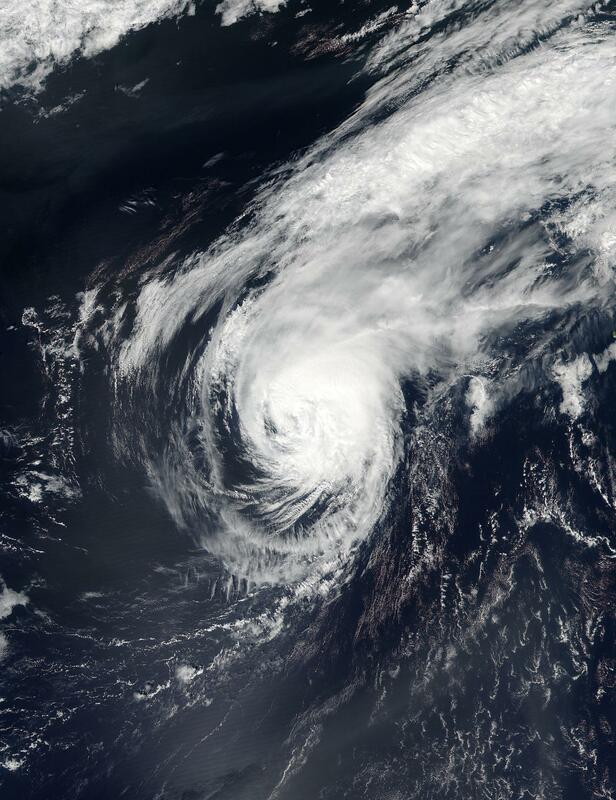 NOAA's Suomi NPP satellite passed over Gaston as it continued to weaken over the waters of the North Central Atlantic Ocean and head toward the Azores Islands. Warnings are in effect in the Azores on Sept. 2. On Sept. 1 at 11:50 a.m. EDT (1550 UTC) the Visible Infrared Imaging Radiometer Suite (VIIRS) instrument aboard the NASA-NOAA Suomi NPP satellite captured a visible light image of Gaston. The VIIRS image revealed that eye had disappeared and the bulk of clouds appeared to be pushed to the northeast of the center as a result of vertical wind shear. VIIRS collects visible and infrared imagery and global observations of land, atmosphere, cryosphere and oceans. On Sept. 2 a Tropical Storm Warning is in effect for Flores and Corvo in the western Azores, and for Faial, Pico, Graciosa, Sao Jorge, and Terceira in the central Azores. On Sept. 2 at 8 a.m. EDT (1200 UTC), the National Hurricane Center noted the center of Tropical Storm Gaston was located near 33.6 degrees north latitude and 33.6 degrees west longitude. That's about 265 miles (425 km) west of Faial Island in the central Azores and about 350 miles (565 km) west of Lajes Air Base in the Azores. Gaston is moving toward the east near 15 mph (24 kph). NOAA's National Hurricane Center said that an east-northeastward motion is expected by tonight, Sept. 2. On the forecast track, the center of Gaston will move near the western Azores today, and pass north of the central Azores tonight. Maximum sustained winds are near 65 mph (100 kph) with higher gusts. Weakening is forecast during the next 36 hours, and Gaston is expected to become a remnant low on Saturday. The estimated minimum central pressure is 992 millibars.